W. Short St. Campus, Sts. 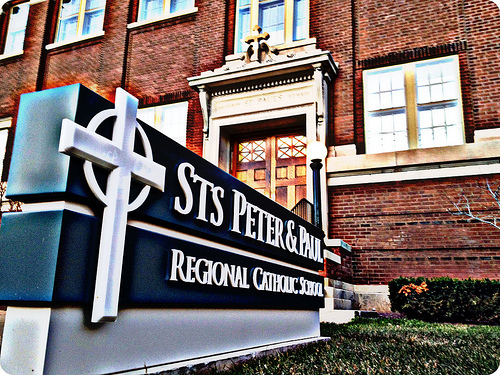 Peter & Paul Catholic School - Lexington, Ky.
Old meets new at the main campus of Sts. Peter & Paul School on Lexington's West Short Street. The two story school at Saunier Avenue (formerly Sycamore Street) first opened in 1915. For seventy-three years, the St. Paul School met educational needs of the parish. Shrinking attendance, however, forced the diocese to close the school in 1988. A few years ago, a resurgence in numbers and a major renovation/expansion of the campus brought new life to the beautiful, historic school. This two story classical revival building on West Short Street first rose from the ground in 1913. 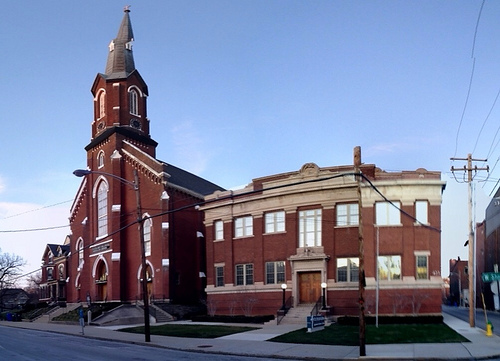 The cornerstone was laid on December 14, 1913 in a ceremony presided over by the Bishop of Covington, Right Rev. C. P. MaesIts brick facade is set back from West Short Street, leaving westward pedestrians (and at one time automobiles) with an undisrupted visual approach to the St. Paul's church. 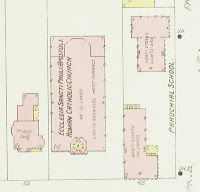 This visual approach was a positive change for the parish as the building previously had no set-back as can be seen on the 1907 Sanborn insurance map of Lexington. It is clear that Frankel did stay at State College, for it was this project some ten years later which left his name forever etched into Lexington's architectural landscape. 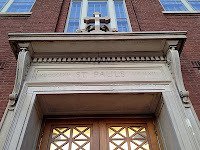 A literal etching exists in the pediment above the West Short Street entrance: "St. Paul's" with the Roman numerals for 1865 (the year of the church's cornerstone, MDCCCLXV) and 1913 (the year of the school's cornerstone, MCMXIII) on either side. 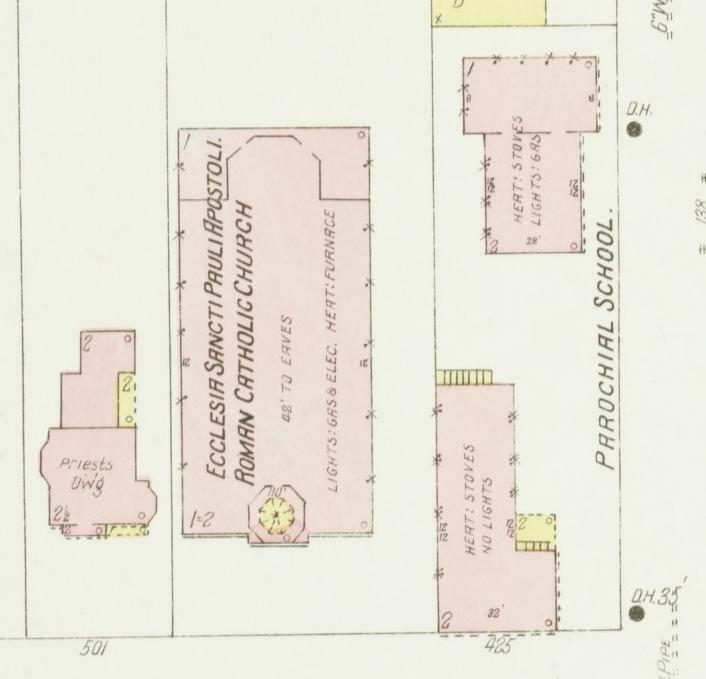 A parochial school, however, did exist on the site before the erection of St. Paul's. In fact, St. Paul's was preceded by St. John's Male Academy which was begun by a Mr. Lamb in 1867. 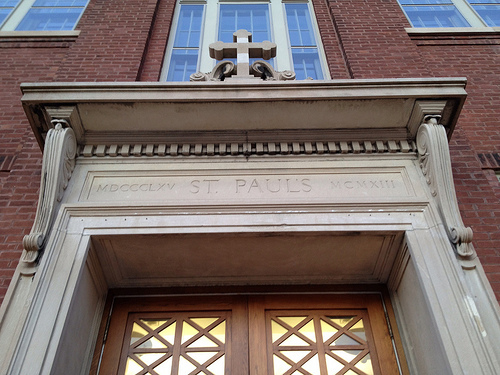 In 1887, the sisters of Charity of Nazareth took over the school and renamed it St. Paul's. A late twentieth-century merger with neighboring parish school St. Peter's created the Sts. Peter & Paul Catholic School. For many years, a utilitarian metal awning allowed weather-protected entrance into the parochial school. Fortunately, this awning was removed and the original lamps on either side of the West Short Street entrance were restored in the recent renovation. The renovation also included a major renovation with new classrooms. Many organizations and individuals stepped up to the plate so that this historic building could once again thrive: Knights of Columbus (gymnasium); Alltech (science labs); and the Lucille Caudille Little Foundation (theatre). Today, nearly 500 students in grades one through eight learn in this modern environment that embraces its historic roots. First floor classrooms retained original hardwood flooring, tall ceilings and enormous windows. A cross in the hallway is made up of tiles painted with student self-portraits; the tiles themselves were from the church's old baptistry. But even before the renovation, this wonderful institution was in 2006 properly recognized as a Blue Ribbon School. For more photos from Sts. Peter and Paul, check out flickr. St. Paul's Catholic Church & Sts. Peter & Paul School - Lexington, Ky. The Bluegrass Trust for Historic Preservation hosts a monthly deTour for young professionals (and the young-at-heart) to a local historic site that has been well-preserved and restored - the group meets on the first Wednesday of each month at 5:30 p.m. Details are always available on Facebook! Our next meeting is this Wednesday, February 1, 2011. Please join us outside the Lexington History Museum (the old courthouse) where we will have the opportunity to get a behind the scenes tour! Join us!! You can see Kaintuckeean write-ups on previous deTours by clicking here.